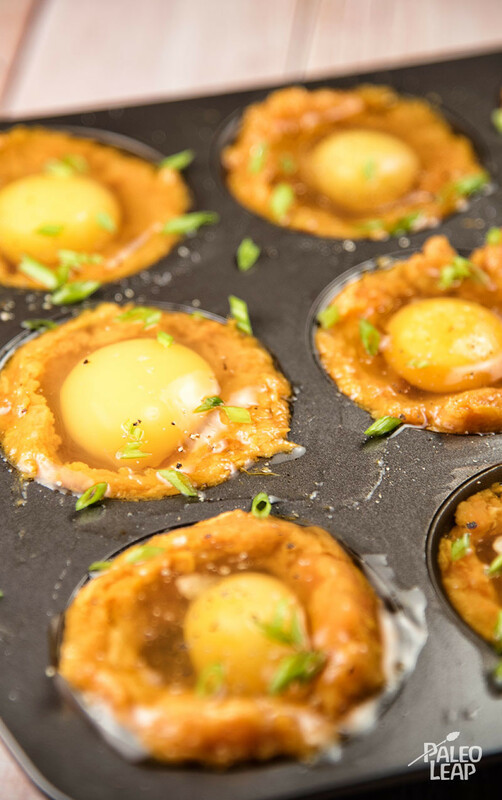 Eggs and sweet potatoes are a classic Paleo breakfast: switch it up a little by trading the omelet-and-baked-potato combo for these cute, bite-sized egg nests. 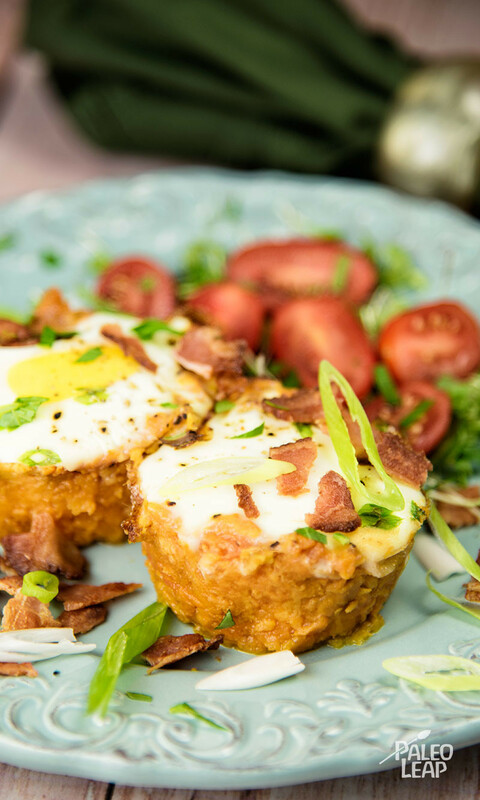 Lining the holes in a muffin tin with grated sweet potato makes a “nest” around each egg, and baking everything keeps it much easier than it looks. Baking the potatoes isn’t terribly fast, but it’s very hands-off (you literally just put them in the oven and walk away), and assembling the nests is also very simple. Adding bacon on top illustrates the healthiest way to use bacon in Paleo cooking: it’s a condiment, not a staple source of calories. You get that crunch and the delicious smoky flavor, without digging into a pound of the stuff straight out of the oven. (Not that there’s even anything terribly wrong about eating a big pile of bacon once in a while – it just shouldn’t be your major protein source at breakfast every single day). If you want to save a little bit of time on the assembly in the morning, you could also make the sweet potato nests the night before, and then crack in the eggs and bake it all up just before you eat. That would make an easy breakfast or brunch for company, or even just as a special treat from you to you. SERVES: 4-6 PREP: 15 min. COOK: 1 h.
Bake the sweet potatoes until almost tender (35 to 40 minutes). Allow the sweet potatoes to cool down. Then peel them, grate them into a bowl, and season to taste. Grease a muffin pan generously with cooking fat. Scoop 2 to 3 tablespoons of sweet potato into each muffin cup. Use your fingers to make a nest shape in each muffin cup. Return the muffin shells to the oven and bake for about 10 minutes. Crack an egg into each nest, season to taste, and sprinkle with fresh chives. Place back into the oven and cook until the eggs are set, about 10 to 12 minutes. Remove the nests from the pan, and serve topped with crumbled bacon.